Dr. Singbeil began his veterinarian career in 1991 after graduating from the Washington State University Veterinary Program, and then after completed a two-year residency for Avian-Medicine and Poultry at the University of California-Davis. 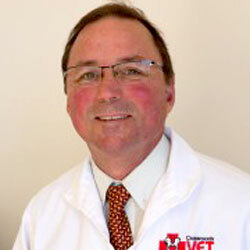 He was the owner and head veterinarian at the former Bellevue Center of Veterinary Medicine beginning in 2003. Subsequently, Dr. Bruce opened Crossroads Vet; a brand new facility with a better location for our patients and their families. We see all types of pets in our practice including birds, cats, dogs, rabbits, reptiles-just ask!